To understand the emergence of a lasting Democratic majority, James Carville first reviews the profound and relentless incompetence of the Bush administration-and the pursuant collapse of the Republican Party. That means looking back at the failure of Republican ideas-including a wholesale rejection of the myth of conservative superiority on the economy-and holding our noses long enough to survey the gallery of truly repellent scoundrels, scandals, and screwups that the Republican Party has been responsible for over the last eight years. 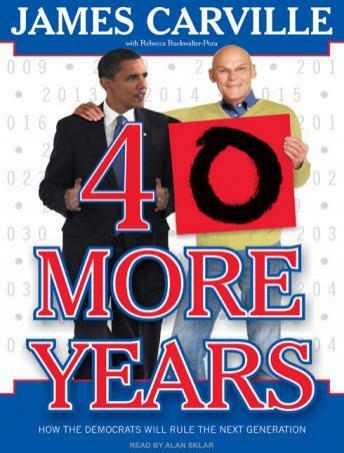 After completing the unpleasant but edifying task of autopsying the Republican Party, Carville examines the underpinnings of Democratic victories in 2004, 2006, and 2008-and makes the argument for why Democrats are going to keep winning (two words: young people). In short, the Republicans are going to keep getting spanked again and again for forty more years because we're right and they're wrong, and Americans know it.